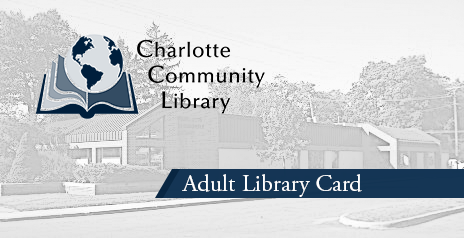 Anyone can apply for a Charlotte Community Library card. Do you live in Carmel or Eaton Township or within the Charlotte city limits? You qualify for Premium Library Service at no additional charge. Until 2023, if you live in Lee Township, you also qualify for Premium Library Service at no additional charge. If you are 18 or over, all you need to bring into the Library is your valid driver’s license or state ID with photo, showing your current and correct address. If your ID does not have your correct address, we will accept a piece of canceled mail such as a utility bill or rental agreement showing the correct address. If you previously had a card and there are existing fines, they must be paid in full before you will be able to borrow any items. You will receive your card in the mail in 7-10 days. Children under 18 must have a parent or legal guardian sign the card application on site. Children are not issued cards. Their name will be added to the database for reference. Do you live in Brookfield, Chester, or Walton Township or within the Olivet city limits? You qualify for Basic Library Service. The same process as above will get you a library card. You may upgrade everyone at the same household to Premium Library Service at the current rate of $40 per year. If you do not live in any of the townships or cities above, then you qualify for an Out-of-District Card. Out-of-District cards are currently $80.00 per household/per year, which will allow everyone living at that address to get a library card. Each person will have Premium Library Service. What is Basic Library Service? If you have Basic Library Service, you may have a maximum of 2 items from the Library checked out at any time. You may use the Library’s computers for up to 1 hour per day. There is no access to OverDrive/Libby, hoopla, MelCat, or any other electronic services. What is Premium Library Service? If you have Premium Library Service, you may have a maximum of 10 items from the Library checked out at any time. You may use the Library’s computers for up to 2 hours per day. Access to OverDrive/Libby, hoopla, MelCat and any other electronic services is also available. Premium Library Service can be obtained for an additional $40 per household/per year for everyone living at the same address. If you live in Eaton or Carmel Township or within the Charlotte city limits, you receive premium service at no additional cost. Residents of Lee Township also receive premium service at no additional charge until 2023. Not sure what township you live in? Click here and enter your information for address verification.